The Omni Hybrid MAXX P3 is a limited run tactical rifle featuring ATI's fully-patented Omni Hybrid MAXX metal reinforced polymer upper and lower receivers. 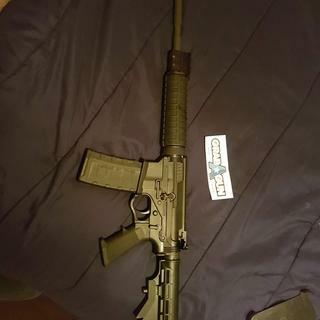 This is my first AR15 and i wanted a cheap one to try different attachments, parts and pieces on. Then I will buy exactly what I want. price and good reviews. my first AR. Should be all I need. Mostly shoot pistols but Have shot my friend's AR and would like my own. Awesome price and good reviews! It is the gun I wanted and at a good price. Because, it's the best deal around. I don't need anything fancy! It's for home security. The world going to hell in a handbasket! I can't do anything but make sure I feel secure. Several friends referred me to your website.. Easy and simple with good pricing...Thanks! This gun had some good reviews and plus I know a few guys that own one. Inexpensive backup rifle for 5.56 & .223! After considering the great reviews and the great price I decided to give it a try. Needed a rifle to be able to shoot several hogs when hunting them. This is ideal and should be very practical. A great deal so far. I'll see what happens when I receive it. Low price. Can turn a small profit with a quick sale. My first AR. since I got out of the ARMY. The price was great and so were the reviews. The price of it. And I have the 410 model like it. Awesome deal for the money!!! Best price out there period! Have other ATI products and they are all great. Also Grab A Gun has great prices and reviews. New item, wanted to test for myself, retired army and will be my first AR after 15 years of leaving service, see if compatible with colt and other mags again for myself. did I say price. I am USMC Vet and am very familiar with this beautiful rifle, for me there's not to many out there that are better than it. and did some research and found that nobody beats GRAB A GUN'S GREAT PRICES, & DEALS. not only do they have the best prices & deals but they also finance & Layaway. Grab A Gun is Awesome. Good reviews online, can't beat this price unless you got it free!!!! Price, dependability. MADE IN USA! Price & good product reviews. Price and reviews were solid, even without a working coupon code! I wanted a semi-automatic rifle for hunting and target practice but I did not want to spend to much money on a gun like this. I've watched video's on thus particular ATI AR15 and was impressed with the comments and the price . The best price found on the web. GrabAGun has great customer reviews. Does the hand guard come off easily? I would put a Magpul one on but don’t want interference with the gas block. BEST ANSWER: Yes it does comes off easy. 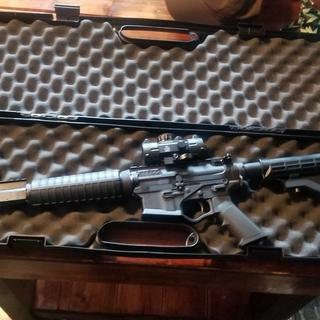 I'll replace it to, Very nice rifle, well worth the money. I have shot over 2000 rounds without any problems. The only issue I've found is that the Tulamo steel case Ammo (steel case only) does not get feeded on the recoil. Do not use the Tulamo Steel Case Ammo. It does remove easily however i installed a low pro gas block for peace of mind for new hand guard. It's a little difficult but not bad, easier with a tool. Hello, one reviewer found that this model had a lot of trouble with steel ammo. Have you other reviewers found this same issue? BEST ANSWER: I have shot about 1000 rounds give or take three months since I’ve had it. One steel casing and one brass casing jammed up with all of that. If that’s any help. Great gun, lots of fun!Enter an answer to this question. Yes, I also have problems with some brand of steel ammo. It doesn't carry the next round in to the chamber. The Wolf steel brand name, did work just fine with it. Hope this help. Thanks. Thanks. Wolf brand is actually the one I am looking to use with this. I shot over 100 steel case Red Army .223 Remington through it 12/8/18 without issue. This rifle works so well I'm probably going to buy two more. I’m mostly using brass and haven’t had any issues. If you are using your own shell casings then there might be an issue. I understand this rifle is chambered 5.56/.223 but is either one better or more preferred? BEST ANSWER: Its dependant on price of ammo and what your wanting to do with it. If you set it up to shoot primarily 5.56 it'll be a little more accurate. But again if your wanting to shoot primarily one ammo over the other then that'll work best. If you switch between the 2 calibers it'll be less accurate with the caliber that you didnt sight it in with. 5.56 and .223 are "virtually" the same thing. They are the same bullet, however, 5.56 is what is authorized by the military, while .223 is what is authorized for civilians. When. Something is chambered for 5.56/.223, it is referring to the size of the ammunition, which is statically identical. 5.56 is only for military personel - the shell is made of metal that eases the process of recycling, and has oils in it to ensure its effectiveness in different terrains. .223 is the civilian calibur of such round, though lacking the aforementioned properties due to the vacancy of necessitation in the civilian, hunting, or sporting aspects that occupy America's domesticated terrains. This AR-15 is really an entry level gun. Something you won't feel bad about dropping it the mud. Using steel over brass rounds makes little difference to me personally! It's primarily for fun, not hunting nor is it a combat gun. I'm an Army Vet who just likes to keep my learned skills in tune. 5.56 is military round / .223 is consumer round. Hunting rifles chambered in .223 should not fire the 5.56 round due to higher chamber pressure produced by the military round. Rifles that are 5.56/.223 can safely fire either round. I personally prefer ,223 but 5.56 is just as good. This ATI Omni Hybrid MAXX P3 can handle both with very good results. I have 3 other brands of ARs, but this one is my favorite. 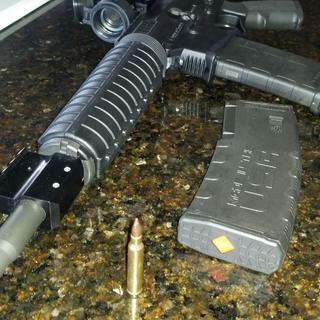 I think the 5.56 NATO is preferred, and that’s what I used. I bought quality ammo and have had zero issues with it. Either one will work fine. Can this rifle be modded with a Magpul MOE M-LOK Hand Guard ? BEST ANSWER: The guard comes off easy. Easier if you have that tool to pinched on the ring and drop backwards towards the magazine I have an aftermarket rail on my rifle does not interfere with the gas walkEnter an answer to this question. Will this rifle accept any AR15 magazine? Does it come with a magazine, and if so, how many? BEST ANSWER: Yes, one magazine. You can purchase more magazines from Grabagun though. Yes it does, but just one though. Yes, it comes with one magazine. I would like to replace the hand guard with one with rails. How long is the hand guard? BEST ANSWER: I believe the length is 7”. This the exact quad rail is used for mine. It was easy to install and fits/looks great! Which aftermarket rail would be best to replace the front hand guard? BEST ANSWER: Peter, I purchased the LEAPERS UTG PRO AR-15 CARBINE LENGTH DROP-IN QUAD RAIL. And it fits perfectly and feels great! This rifle is all I expected it to be and more. Haven't had a chance to shoot it yet but but looks nice. Bought an extra mag and red/green dot scope for it since the price was budget friendly. GrabAgun like always has great deals. Price was great. The quality is the same as a more expensive models. I'm not someone who spends weekends at the range. But once or twice a year suits me fine. Smooth trigger, lightweight what's not to like about that! Even a friend who knows everything about the armor lite 15's says it's worth every penny I spent and more. Thank's American Tactical, and Grab A Gun. installed a red dot optic and shot 30 rounds and so far it shoots nice. looks like it would cost double. Awesome rifle. Shot over 500 rounds of steel case straight out of the box no problem. 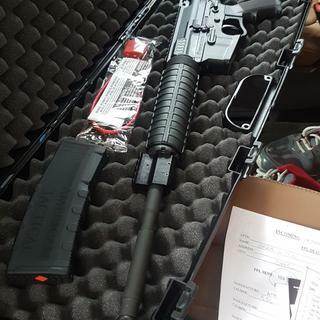 Got this gun at a great price with fast service. I love this thing. Great price ,awesome shooting, good quality parts, very surprised by how awesome it is. I read and watched a lot about it and there are some haters but pretty sure the haters have extra money to blow for no reason and might be embarrassed by it because it is so cheep. But as for me the price doesn't matter, does it work and is it awesome and the answer is heck yea it does. So glad I made the purchase !! The gun is enjoyable to shoot, easy to add accessories and all at a great price. Both guns I have bought had to have a gunsmith's attention before I could shoot them. That's sad for ATI. ATI should never ship weapons that are not correctly assembled. Perfect, especially considering the price. Shoots well, and accurate. Put 100 brass rounds through it without any issue. Gonna put another few hundred through it and will update my review if anything changes. I really enjoyed the way it handled and how accurate it was that surprised me. I recommend for anyone. Pretty good gun for the money. Pretty accurate. no complaints. Good, but doesn't shoot steel cases ammo. It's a nice gun, but the 2 stars are because it doesn't work properly with the steel cases ammo. Recoil doesn't insert the next round in the chamber. Wish they could of done a better job on this issue while designing the rifle. Besides that, it is a very nice rifle, and my rounds concentration are around 1/2 to 1 inches. Buy from Grab a Gun!!! Just had the time to site it in last week. It’s a legit piece. I have AR’s that are much more expensive that don’t perform as well. I’m here to say this is an amazing firearm. It doesn’t come with any sights but that’s ok with me because I always change them anyway. It would have been nice if it would have had more p-rail on the forward stock of the rifle and also if it would have accommodation for 2 point connection for sling on the forward stock. If you only use single point connect sling such as Magpul then it’s perfect. I’ve put 1000 rounds through it so far and only just yesterday took it apart and cleaned it. It hasn’t jammed or misfired even once. It shoots very true. I’m dialed in for 200yrds right now and am hitting 3/4” groups. I will definitely be buying one of the AT’s in the .300 very soon. Order came on time. Nice looking rifle that’s shoots well and at a great price. The P3 is built with a revolutionary Nano Composite Parts Kit. This kit includes the hammer, trigger, disconnector, takedown pins, safety selector, magazine release and detents all made from nano composite material that is just as strong as metal components but at only 1/2 the weight. The 16" barrel has a 1:7" twist for increased accuracy and a black nitride finish for protection against the elements. The P3 model has an M4 adjustable stock with an A2 style handguard.